Mind Maps are not a new invention, they have been used for over 30 years. Tony Buzan is credited with developing the process. With the advent of software that makes it easy to create and share, mind maps have experienced a resurgence. I use them for everything, planning clients' website redesigns, project management, the works. Here is a link to a mindmap I created with a colleague to help plan a teleseminar. The great thing about mind maps is that they show you the big picture and the details at the same time. You'll note that you can see how all the pieces fit together and how revenue will be generated. They are easy to do and a paper and pencil works too. Try it and let me know how you used it to help you reach your business goals. Also, you can download my self-assessment map and refer to it as a model for creating your own Time vs. Revenue analysis. Want to hear about how to become more valuable and do amazing work to help you survive and thrive in this recession? Of course you do! So check out Mindjet's November Newsletter. My column is there (shameless plug) along with really very talented visual mappers like Chuck Frey and Brian Friedlander who give you their take on the new MindManager 8. It is chock full of MindManager 8 tips & tricks as well as information on upcoming live webinars for everyone considering an upgrade to version 8. If you want to change the way you work, visual mapping is for you! 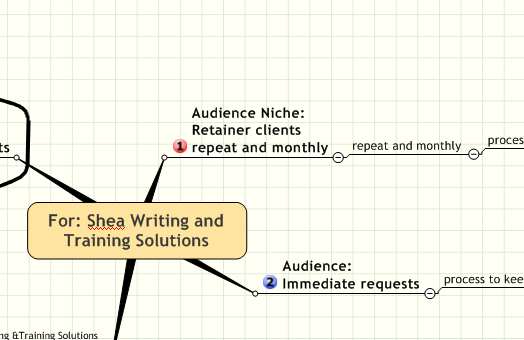 Anyone who reads this blog knows I'm an evangelist for all things Mind Mapping. I'm particularly excited about the new release of MindManager 8 by Mindjet. It's a quantum leap for mind mapping tools. The big takeaway is that you can now share working maps with anyone regardless of whether they own the software! Also in this version you can stay within the working map while you link to databases, create project tasks and search the web. You asked -what are the elements of a Mind Mapping session? I often mention Mind Mapping in this blog as a way to create and problem solve. Several of you have asked me to detail the basic elements of a mind mapping session so that you can get started. Depending on where I am, I will use software (MindManager 7 from Mindjet is my favorite) or some form of paper and pens. 2. A way to view the map as a 'big picture'— It's very important to be able to stand back and see the map as a whole. You can use a wall, computer screen, a pad or anything you can step back from and see the entire map at once. 3. A flexible way to move ideas around—This is where the tools become really important. If you write on a sheet of paper, you'll have to redraw the map to suit the structure you develop. If you use sticky notes or a computer, you can move things around at will. Being able to recognize patterns and shape the map is key to a great outcome. 4. A way to stimulate creative thinking—Here's where the use of colors, pictures and anything else you want to throw into the mix will help stimulate better ideas and help you remember what you mapped. 5. A way to document and update your map—Don't forget that part of the mapping process is to let it incubate and further your thinking over time. You'll need to come away with something that is tangible so you can review it and stimulate more ideas. If you've got lots of maps or they are large, grab your digital camera and make sure to capture all of it. Do you feel that your product or service is so unique that you just aren't sure how to find your customers? In my Mindjet newsletter column this month I present a case study about How to find the perfect customer for your product. In the article you'll find a link to a mindmap template you can use to help find your perfect customers. Check out my February column called "Create a Mailing List Building System with MindManager Pro 7" in the Mindjet.com Monthly Newsletter. It shows you how to use a mailing list to take your successful business to the next level and includes a map template you can use to build your own system. If you use Mind maps, check out my new Mindjet newsletter column where I have a free MindManager 7 dashboard template you can use to track your company's buzz. Also, if you're so inclined, fill out the form in the column to tell me about your online marketing issue. If I choose your issue, I'll create a free mind map to show you how I'd deal with it and it will be published in the newsletter. Also, let me know if you use the buzz tracking dashboard and if you have any feedback. 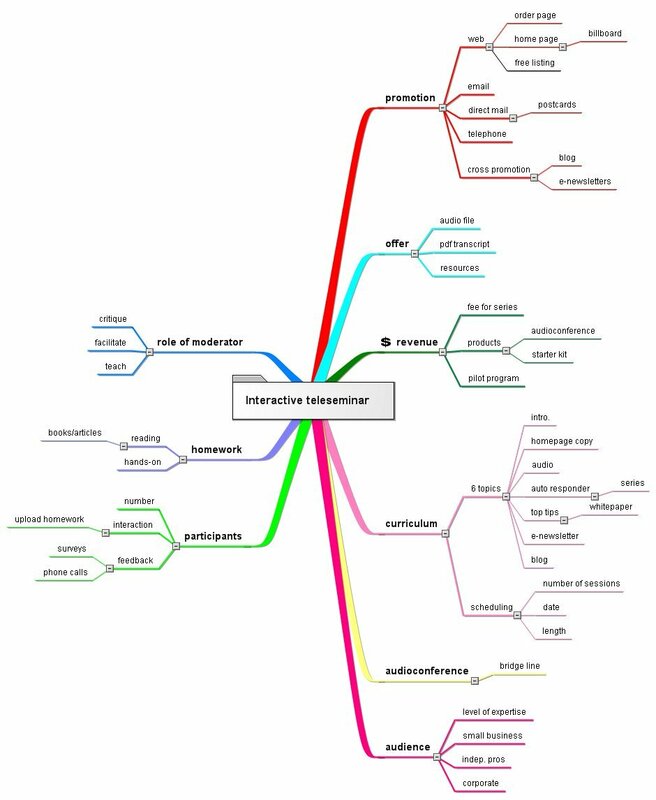 Anyone who has read my blogs or looked at my website knows that I think mind mapping is an essential tool. BusinessWeek Online, Sept. 25th, has a short blurb called "A Mind Map From IDEO'S David Kelley." He sums up the use of mind maps perfectly when he says, "When I want to do something analytical I make a list. When I'm trying to come up with ideas or strategize, I make a mind map." Small business owners often find themselves having to strategize alone—no big staff, no input, just a blank page and a bunch of ideas. If you face this on a regular basis, a mind map will help pull out the information you need to create a plan and build an effective strategy. I have some samples on my website I call DigiMaps. Take a look at them, teach yourself the very easy process and you'll see that it can help you create a solid strategy in half the usual time.